Today is one of those days when I have no idea what I want to write about. Usually before I go into the recipe, I have something to write about, family events, news, thoughts etc. There is a lot happening in this world but I have no inclination to write about it. So today I’ll just straight go to the recipe. 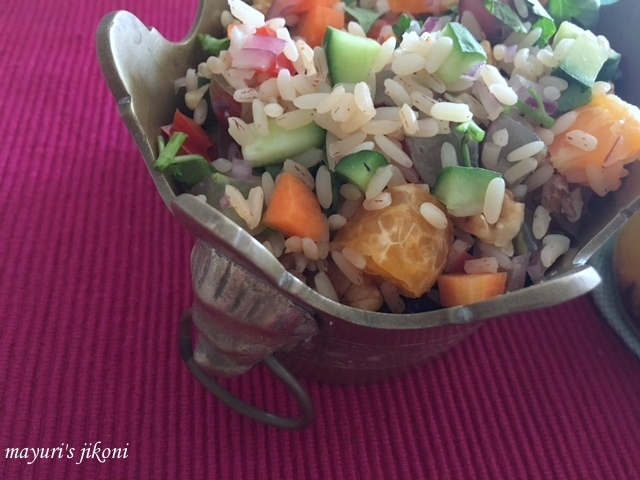 #FoodieMonday #Bloghop team decided on a hot or cold rice recipe as our 81st theme. Taking rice as the main ingredient, we were suppose to make a piping hot dish or a cold dish. I didn’t want to make anything piping hot as its just too hot here in Mombasa. So for cold I had options of kheer, phirni, rice pudding. My family didn’t want anything sweet so I decided to make a cold rice salad, full of vegetables, fruits and nuts. This was our lunch, just the right sort of meal to beat the heat. Surprisingly, after having the salad we didn’t feel lethargic because of the rice. I guess because the quantity of rice used is less and the salad had more lighter healthier ingredients. To prepare the dressing, put all the dressing ingredients in a small jar. Cover it with the lid. Put the dressing in the fridge to cool till required. Wash the rice in a sieve under running water for a few seconds. Boil 1 cup of water with ¼ tsp salt and a few drops of oil. Add the rice. Cover the pan and cook the rice till its done. Make sure you don’t overcook the rice. Take the rice out into a plate. Spread it out with a fork and let it cool. Once the rice is cool, add all the remaining salad ingredients. Mix it well. Keep the salad in the fridge till its chilled. To serve, shake the jar with the dressing, give it a good shake. 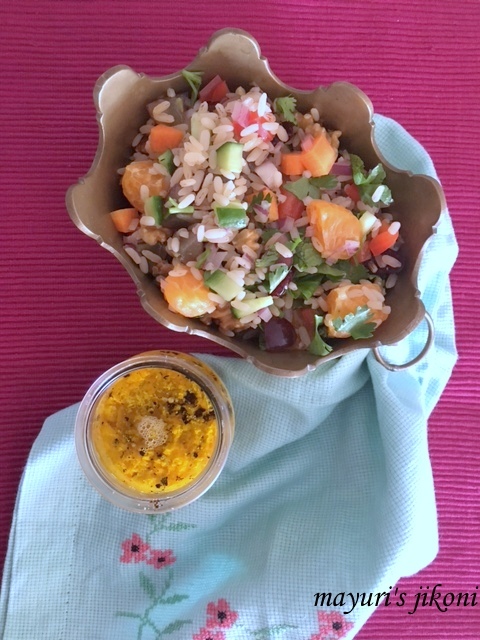 Add the dressing to the rice salad and enjoy a cold salad on a hot day. I used a medium grained light brown rice (don’t know what its called). Use leftover rice to prepare this filling salad. A cold salad with brown rice is surely light for the tummy as well. Healthy share indeed Di! Healthy share. Loved it. Looks super tempting. Will try it for sure. 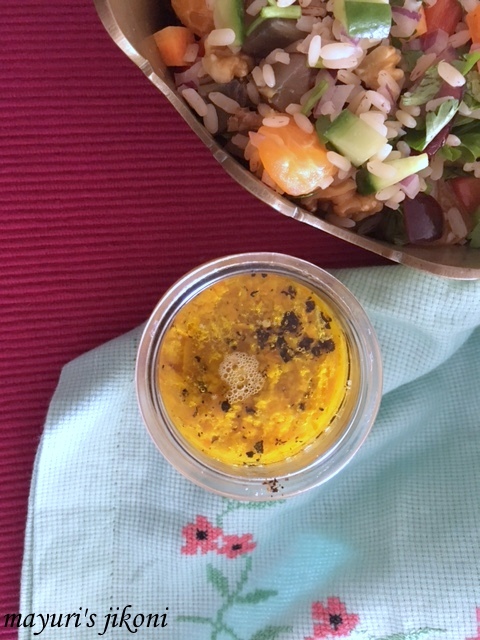 Wow dee orange ginger dressing surely made me drool…what a beautiful share. This rice salad looks tempting, I have not tried rice salad before. Rice salad sounds interesting! Lovely Share. Bookmarking this recipe.